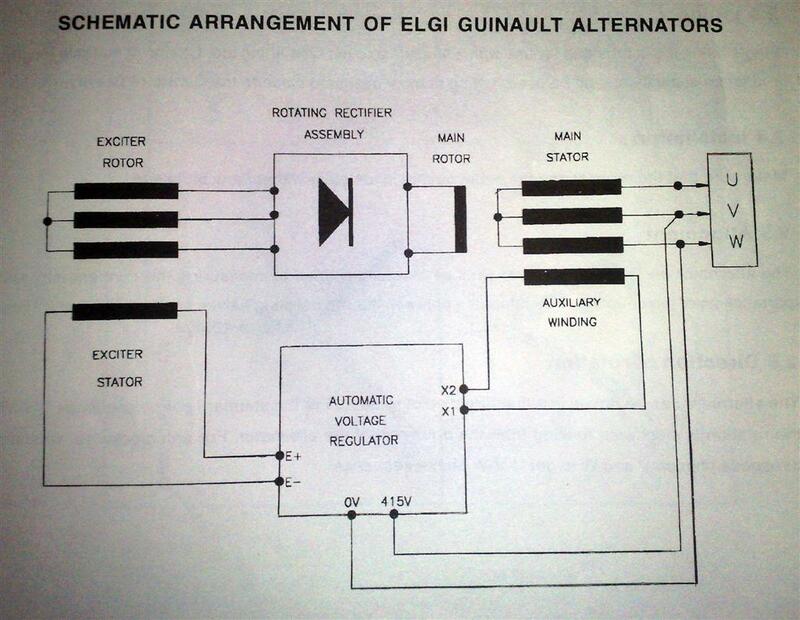 Elgi Electric & Industries Ltd manufactures alternators in technical collaboration with Guinault France. There was 20kVA to 380kVA Alternators available. Now Elgi Electric has stopped production of Alternators and they are more concentrating in AC Motors and DC Motors. Sara Elgi is a group of companies from Textiles, Software, Building etc. The following figure shows a schematic diagram of Elgi Electric make Alternator. There are five windings in Elgi alternators. 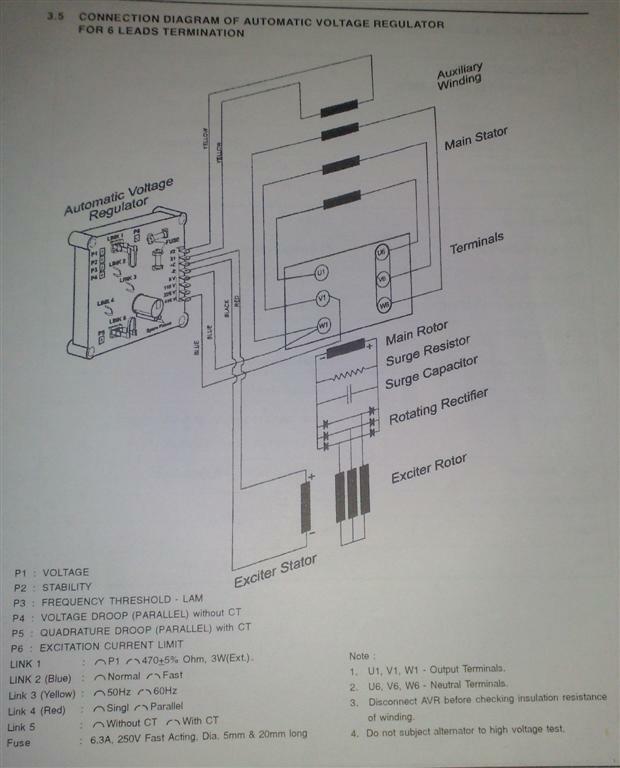 Exciter Field, Exciter Armature, Main Field, Main Armature, Auxiliary Winding. The Auxiliary Winding is wound over the Main Armature (Stator). This winding gives 40V, 6A AC supply for AVR. Exciter Field is also fitted with Permanent Magnets. This will avoid break down of alternator due to loss of residual magnetism. Due to the permanent magnets there will be around 100V output between phase without AVR. If alternator does not produce 80 to 100V at rated speed with out AVR we can suspect any internal fault with the alternator. The AVR has SIX connections. One pair (X1 & X2) gives input supply to the AVR from the Auxiliary winding. There is a 6.3A, 240V Fast blow 20mm glass fuse in the input section of the AVR. The DC out put from the AVR to the exciter field coils are available at (E+) & (E-) terminals of the AVR. There 3 voltage selection in sensing side of AVR. 0-110V, 0-220V, 0-415V. The normal selection is 0-415V. These terminals are connected to the V & W (Y & B) phase output terminals of alternator. 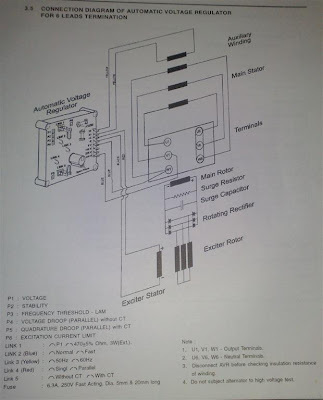 The following figure shows the wiring diagram on Elgi Electric make Alternator and AVR. Earlier there was SIX lead out alternators but the last alternators were of 4 leads. The stator winding was internally STAR connected and common neutral was taken out. There are Potentiometers for adjusting Output Voltage (P1), Voltage Stability (P2), Under Frequency cut-off (P3), Voltage Droop for parallel operation (with out Current Transformer) (P4), Quadrature Droop for parallel operation (with current transformer) (P5), Excitation Current Limit (P6). All these POT other than P1 and Droop setting are factory set. We can also connect an external potentiometer (470 Ohms, 3Watts) at LINK1 for adjusting the output voltage. AVR used in all type of Elgi Alternators (20kVA to 380kVA Brush-less) are the same. If we are not getting normal output from the alternator then it is very easy to check whether there is any fault with the alternator winding. Check all winding for any grounding and continuity. For this first remove the outgoing cable from the alternator. Check each winding including auxiliary winding and exciter field winding. If it shows healthy then remove the F6.3A glass fuse from the AVR. Start DG. Check voltages at output terminals of Alternator and X1X2 terminals at AVR. For a good alternator we should get a balance output of around 100V at alternator terminals between phase and 10V at X1X2 leads. If it is OK then the fault will be with AVR. If we are not getting balance output at alternator terminals then the there can be a winding failure. If we are getting very low output (2V or less than 10V) then the fault will be with exciter armature, RRA or main field. Thanks for encouragement. You can write to me.